Clarification: This is an original report by TGP contributor Lucian Wintrich. TGP founder Jim Hoft had a similar conversation with Russian reporters visiting St. Louis in January. The Russian reporters told Jim Hoft the Kremlin was determined to undermine Hillary Clinton because they believed the polls and liberal media saying there was no way she could lose. So now Russia has the problem of promoting an underdog candidate who ended up winning. 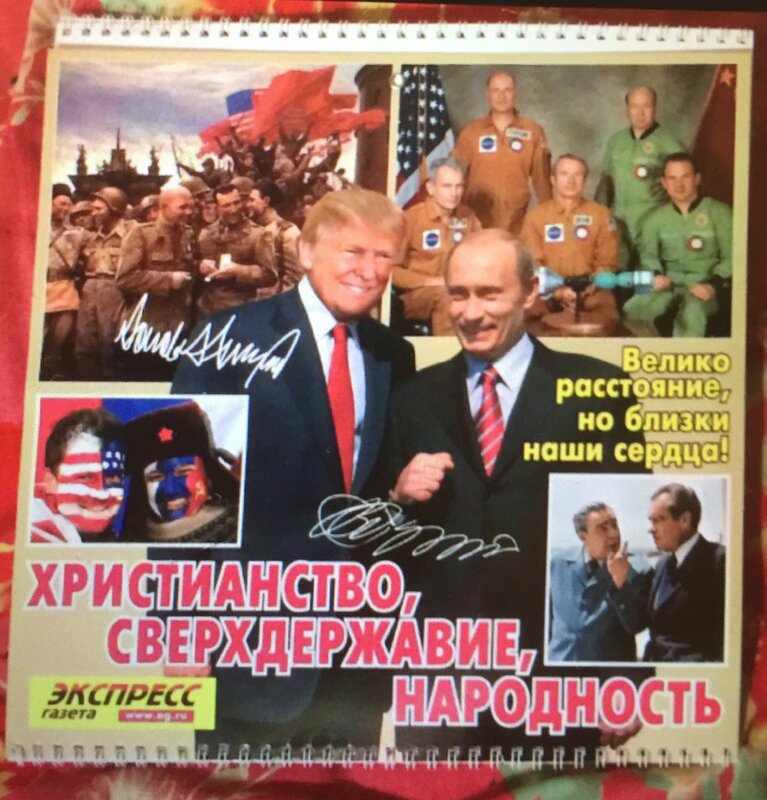 Here is a photo of a popular calendar in Russia today — Putin and Trump. I was contacted a few days ago by a Russian who asked if he and his friend could grab drinks with me. His friend became interested in my work in the US elections after they had read about me in a conservative Russian publication for my “Twinks4Trump” series.He asked if I would sit down with him and answer a few question about my specific way of combating progressives. Shortly after sitting down and sharing a beer with them, I (somewhat) joked that I briefly had a KGB writer submitting for a publication that a friend and I ran back in October. I told them that one of our writers presented himself as an attractive 19-year-old black conservative, named “Demarcus Owens”, but his articles were astonishingly good and well researched. It’s rare for an attractive black 19-year-old to be writing at grad school level (not racist, just an observation). After I said this, they spoke in Russian briefly, went to the ATM to withdraw some more cash (it’s a cash only bar). They came back with a few beers and I asked for a brief interview. The one who spoke better English obliged, I’ll call him ‘C’. TGP: So, that guy “Demarus”. Brilliant f*cking writer, incredible research, and he worked for free. Unfortunately, he went silent a night before the election. He had an entire social media presence with over 20k followers and thousands of retweets and engagement…. Can the KGB send me a few more of those? It was great working with him. C: [laughing] Yea, that sounds like one of ours. C: Sort of. The goal was to undermine Hillary’s presidency from the beginning, it was supposed to continue to do that while she was president, to undermine it. The goal was to work with freelancers to help spread news stories, to help the American public see they were about to elect [Clinton] a corrupt President. That helps Russa, too when we show that. TGP: Okay, so they basically hired grad school students to start cool looking Twitter accounts and help fill the void for good journalism? When I read about the liberal news and what they’ve said about it, they’ll act like you guys were tampering with the voting machines. C: [loudly laughing] that’s great. They’re idiots. They was only working to undermine her presidency, Russia thought she’d win. I personally am not thrilled about Donald Trump, but he’s better than Hillary. Everyone knows he’s better than Hillary. TGP: I know in Russia, you have a growing problem with Islamic immigration terrorism, are you seeing similar patterns here in America? C: It is a huge problem with illegal Islamic immigration, we have no borders and we can’t exactly stop it. We don’t have an easy solution. To ask you a question, this “ANTIFA” in America – we have had these groups in Russia for the past 15 years – are you scared of them? TGP: I think that their aggression alone, I mean they beat people with pipes in California, is only going to continue here. Such being said, they are showing other liberals here exactly how their party behaves. How misinformed people here behave. When you start screaming ‘Nazi!’ at random people who support conservative values, that’s the same as calling a black guy a ‘Klansman!’ it doesn’t make sense, it doesn’t hold up. As long as conservative Americans stick to the truth, I think the left is going to continue to dissolve. C: That makes sense. Groups like this are only on the rise in Russia. I am not for Putin, I am not for Trump, or this. But these groups that call themselves ‘anti-Fascists’, in Russia they beat gays, women. They are almost as bad as the groups like ISIS. I’ve seen the quote, “In the future, the real fascists will call themselves Anti-Fascists” [laughs] it confuses people that they will think it is the good side, they believe it. Just look at what groups like ANTIFA are doing in Russia. They wear masks too, the kill, they beat gays, they beat what you call ‘libertarians’. they say they are standing up against fascism. It makes no sense. TGP: That’s ‘identity politics’ as a whole. They claim victimization while they are the ones victimizing others. Tim Kaine, Hillary’s crack-head VP nomination literally called for “violence in the streets” against conservatives. The left in America is only getting more violent by the day. Anyway, thanks for meeting up with me. Before you head back to Moscow, I’d love to sit down again, more extensively. The most notable takeaway from this discussion were the acknowledgment, and TGP has previously remarked on this, that while there was Russian involvement in the elections, the involvement was simply to undermine Hillary (who they thought was inevitable). The involvement wasn’t nefarious by any means, but it was quite simply just helping to expose stories about her that were under-reported. The writer that I had previously worked with, “Demarus”, was just that – an incredible writer and journalist. 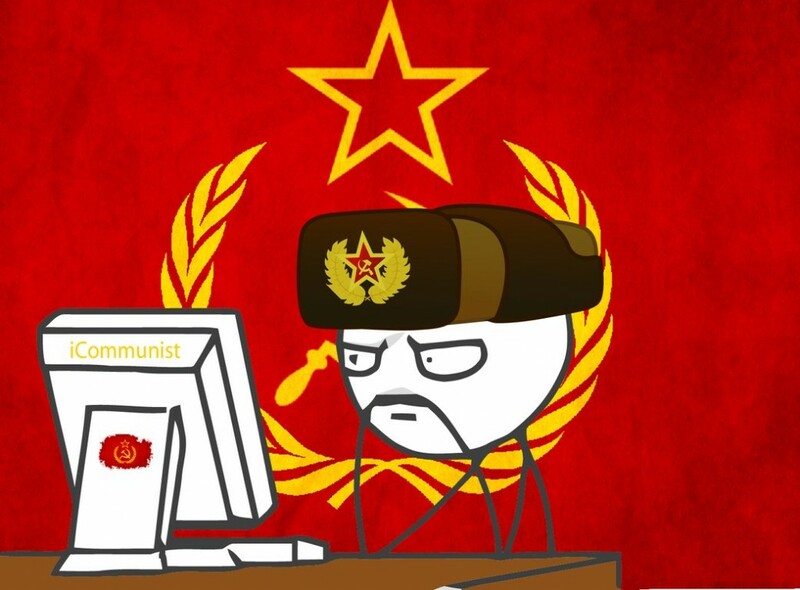 In reflection of that, I find it pretty sad that right now the state of American journalism is so over-run with liberal hacks, that we occasionally end up inadvertently out-sourcing to Russia for quality journalism about America.